Tag line: "His hideous howl a dirge of death!" Larry Talbot (Lon Chaney Jr.), who’d been living in America, has just returned home to his family’s estate in Wales, where he’s reunited with his father, Sir John (Claude Rains). While out walking one evening with Gwen Conliffe (Evelyn Ankers), who runs the village’s antique shop, the pair come across a young lady (Fay Helm) being savagely mauled by a wolf, and even though the animal bites him as he attempts to intervene, Larry soon kills the creature before it can do more harm. Yet the story doesn’t end there, for according to a local gypsy (Maria Ouspenskaya), the wolf Larry destroyed was, in reality, a werewolf, and because it bit him, he, too, is now cursed to spend his nights roaming the countryside as a wolf. Of course, Larry doesn’t believe such nonsense, but quickly changes his tune the very next evening, when he transforms into a werewolf and goes on the prowl in search of human blood. 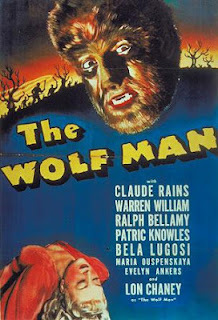 Along with Chaney’s compassionate turn as the tortured victim of a werewolf’s bite, The Wolf Man features a number of fine actors in key roles. Claude Rains, who had played a Universal “monster” of his own in 1933’s The Invisible Man, is solid as Sir John Talbot, while the werewolf that bit Larry is (in mortal form, anyway) none other than Dracula himself, Mr. Bela Lugosi. Yet, apart from Larry Talbot, the person you’ll remember most from The Wolf Man is the gypsy woman, Maleva, as portrayed by Maria Ouspenskaya. Aside from being the only one who knows what’s going on, she correctly predicts what’s about to happen, all the while providing the film with its dash of the occult. Ms. Ouspenskaya would reprise the role two years later, in Frankenstein Meets the Wolf Man, and it’s a pity she didn’t get to play her more often. As far as the on-screen terror is concerned, The Wolf Man puts the focus more on character development than actual horror; Talbot’s “transformations” are usually brief, and the scenes depicting his attacks somewhat restrained. While this approach occasionally weakens the film’s power to send a chill up your spine, it does give us a creature we not only relate to, but can sympathize with as well. In the pantheon of Universal Studios’ monsters, the wolf man was a bit of a late arrival; by the time Chaney's beast hit the screen in December of 1941, we’d already met Frankenstein, his Bride, and the Son. Yet this tardiness did nothing to diminish the character’s reputation, and thanks to the wonderful work of its cast, The Wolf Man would take its rightful place as one of the cinema’s most recognizable creatures. On of my favorites of the Univeral cannon. This is my favorite of the old Universal Monsters. I thought Lon, Jr. really made Larry the most sympathetic of all the "monsters". Brilliant review. As are all the ones I've read. Found you through Twitter and have been wasting far too much of my time reading the various reviews here. Keep up the good work. @Cary: Lon Chaney Jr. is a BIG reason why this movie has remained timeless. His turn as Larry Talbot was a highlight, not just of the film, but of Universal's entire horror canon. And thank you for the kind words! They're greatly appreciated. Thanks also for taking the time to check out the blog. Have a great day!